Musings of an electronic cigarette smoking man. A table of application development for the hashistack. And now for a short update, here’s my HashiConf presentation for this year. Every modern application has a requirement for encrypting certain amounts of data. The traditional approach has been either relying on some sort of transparent encryption (using something like encryption at rest capabilities in the storage, or column/field level encryption in database systems). While this clearly minimizes the requirement for encryption within the application, it doesn’t secure the data from attacks like a SQL Injection, or someone just dumping data since their account had excessive privileges, or though exposure of backups. In comes the requirement of doing encryption at the application level, with of course the expected complexity of doing a right implementation at the code level (choosing the right cyphers, encryption keys, securing the objects), and securing and maintaining the actual encryption keys, which more often than not, end in version control, or in some kind of object store subject to the usual issues. Traditionally, there has been different approaches to secure encryption keys: An HSM could be used, with considerable performance penalty. An external encryption system, like Amazon’s KMS, or Azure Key Vault, or Google KMS’s, where the third party holds your encryption key. Ultimately, HashiCorp’s Vault offers it’s own Transit backend, which allows (depending on policy) to offload encryption/decryption/hmac workflows, as well as signing and verification, abstracting the complexity around maintaining encryption keys, and allowing users and organizations to retain control over them inside Vault’s cryptographic barrier. As a brief summary of Vault’s capabilities, when it comes to encryption as a service, we can just refer to Vault’s documentation. The primary use case for transit is to encrypt data from applications while still storing that encrypted data in some primary data store. This relieves the burden of proper encryption/decryption from application developers and pushes the burden onto the operators of Vault. Operators of Vault generally include the security team at an organization, which means they can ensure that data is encrypted/decrypted properly. Additionally, since encrypt/decrypt operations must enter the audit log, any decryption event is recorded. The objective of this article, however, is not to explain the capabilities of Vault, but rather to do an analysis of what’s the overhead of using Vault to encrypt a single field in the application. For that purpose, a MySQL data source is used, using the traditional world database (with about 4000 rows), and the test being run will effectively launch a single thread per entry, that will encrypt a field of such entry, and then persist it to Amazon S3. As for concurrency, this is running 4 thousand threads that are being instantiated on a for loop. According to this limited dataset (about 4000 entries) we’re looking at a 5% ~ 10% overhead, in regards to execution time. 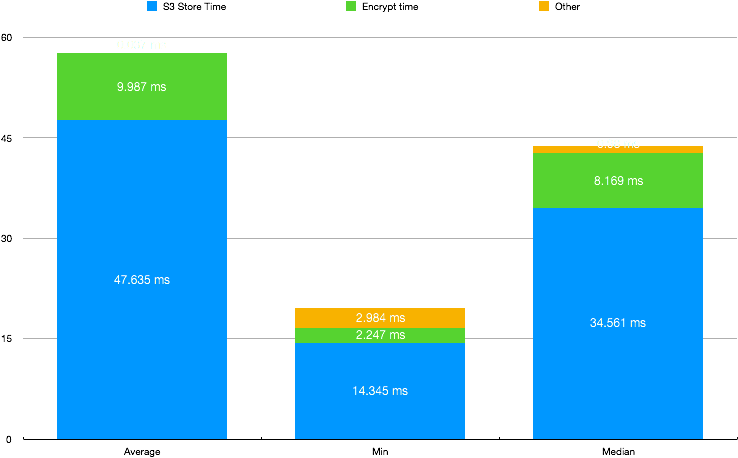 It’s worth noting that during the tests Vault barely break a sweat, Top reported it was using 15% CPU (against 140% that Python was using). This was purposely done in a limited scale, as it wasn’t our intention to test how far could Vault go. Vault Enterprise supports Performance replication that would allow it to scale to fit the needs of even the most demanding applications. As for the development effort, the only complexity added would be adding two statements to encrypt/decrypt the data as the Python example shows. It’s worth noting that Vault supports convergent encryption, causing same encrypted values to return the same string, in case someone would require to look for indexes in WHERE clauses. Excessive privileges: Using transit, in combination of Vault’s Database Secret Backend, an organization can ensure that each user or application get’s the right level of access to the data, which in its own can be encrypted, requiring further level of privilege to decode it. Privilege abuse: Using transit, the data obtained even with the right privileges is encrypted, and potentially requiring the right “context” to decrypt it, even if the user has access to. Unauthorized privilege elevation: Much like in the cases above, Vault can determine what is the right access a user gets to a database, effectively terminating the “Gold credentials” pattern and encrypting the underlying data from operator access. Platform vulnerabilities: Even if the platform is vulnerable, the data would be secure. SQL injection: As data is not transparently encrypted, a vulnerable application would mostly dump obfuscated data, that can be re-wrapped upon detection of a vulnerability to an updated encryption key. Weak audit: Vault audits encryption and decryption operations, effectively creating an audit trail which would allow to pinpoint exactly who has access to the data. Denial of service: Through Sentinel, our policy as code engine, Vault can evaluate traffic patterns through rules and deny access accordingly. Database protocol vulnerabilities: As before, even if the data is dumped, it wouldn’t be transparently decrypted. Weak authentication: Using Vault’s Database secret backend, would generate short lived credentials which can be revoked centrally, and have the right level of complexity. Exposure of backup data: Backups would be automatically encrypted, just like the underlying data. About the author: Nicolas Corrarello is the Regional Director for Solutions Engineering @ HashiCorp based out of London. The Jenkins credential store in most enterprises is becoming a potential attack vector. It’s generally filled with long lived credentials, sometimes even to production systems. WARNING: Dev mode is enabled! Please don’t run a Vault cluster in dev mode on production, feel free to reachout through the usual means if you need help. In this case, tokens assigned to the java-example policy would have permission to read a secret on the secret/hello path. Note that in this case, the tokens generated through this policy have a time-to-live of 60 minutes. That means that after an hour, that token is expired and can’t be used anymore. If you’re Jenkins jobs are shorted, you can adjust that time to live now to increase security. $ vault write secret/hello value="You've Succesfully retrieved a secret from Hashicorp Vault"
Now Jenkins will need permissions to retrieve Secret IDs for our newly created role. Jenkins shouldn’t be able to access the secret itself, list other Secret IDs, or even the Role ID. Jenkins only knows it’s Vault Token (and potentially the Role ID) but doesn’t know the Secret ID, which is generated at pipeline runtime and it’s for one time use only. The Role ID can be stored in the Jenkinsfile. Without a token and a Secret ID has no use. The Secret ID is dynamic and one time use only, and only lives for a short period of time while it’s requested and a login process is carried out to obtain a token for the role. The role token is short lived, and it will be useless once the pipeline finishes. It can even be revoked once you’re finished with your pipeline. Reading credentials from the Jenkins credential store. In this case I’m storing both the ROLE_ID and the VAULT_TOKEN I’ve generated for Jenkins. As mentioned before if you want to split them for more security, you can just use the ROLE_ID as a variable in the Jenkinsfile. I’m doing a set +x to disable verbosity in the shell in order not to leak credentials, although even with -x, in this case I’m just showing the Secret ID (which is useless after I’ve already used it), and the VAULT_TOKEN that I’m going to use to consume credentials, which is short lived, and can be revoked at the end of this runtime just adding a vault token-revoke command. I’m retrieving a SECRET_ID using Jenkins administrative token (that I’ve manually generated before, that’s the only one that would be relatively longed lived, but can only generate SECRET_IDs). I’m doing an AppRole login with the ROLE_ID and the SECRET_ID, and storing that token (short lived). My Java Process is reading VAULT_TOKEN and VAULT_ADDR to contact Vault and retrieve the secret we stored. 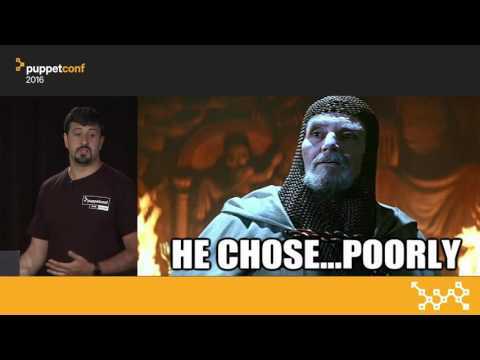 And now for a short update, here’s my PuppetConf presentation of this year. Yet another OpenSSL vulnerability in the loose. While the vendors release fixes, Puppet to the rescue!. Let’s start by disabling those weak ciphers. Time to extend your Puppet Language skills! 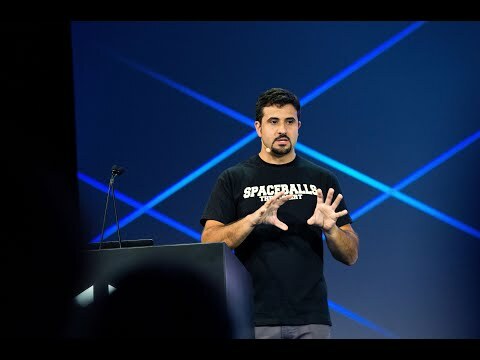 The new features for application orchestration introduce a number of language constructs you’ll want to know about if you’re planning to describe your applications and supporting infrastructure in the Puppet language. If you haven’t worked with Puppet types and providers before, I’d strongly suggest you read the documentation on custom types and providers (available here https://docs.puppetlabs.com/guides/custom_types.html and here https://docs.puppetlabs.com/guides/provider_development.html, respectively). It is worth noting that, unlike your traditional Puppet types and providers, an environment service resource type is far simpler to develop, as you’ll see in the first example below. The environment service resource is the key to defining the relationship between different software layers. It effectively extends a traditional Puppet type (like file, services, or packages) to describe application services (an SQL database, web server, API layer or a microservice, for example). Like Puppet node types, the environment service resource can (optionally) have a provider, which in this case implements a number of service-related methods — for instance, how to check if an environment service produced by an application component is actually ready for work before continuing the deployment. What I’m doing here is telling the Puppet resource abstraction layer (or rather the service abstraction layer) that I have modeled an SQL database that can be produced by a server (managed with Puppet), for use by one or more servers that need an SQL database. You can think of it as a contract between the servers on your network: What information do they need to exchange in order to interoperate? The component in your applications should be iterable — that is to say, you should be able to deploy multiple instances of your layers (multiple web servers, for example). What better way to do that than the way you’ve been doing it historically, with defined types? Here’s where you can leverage your existing modules, profiles and roles. Remember, Puppet is about code reusability; you don’t need to reinvent the wheel every time you do something. # For simplicity, I’m declaring the mysql::server class here but you’d normally do this outside of the define (Preferably in Hiera). Now I’ve told the Puppet parser that this particular define type is producing a resource, and I’m mapping the parameters of this type to the parameters of this resource. I’m declaring variables in the defined type that are going to be filled with parameters from the environment service resource. I’m also declaring that this defined type consumes the environment service resource, but I’m not mapping any variables. That’s because I’m using the same names for the variables. As you can see, it’s here where I’m actually defining the variables to configure the services and create the environment service resource. Think of your microservices running in Docker containers — this is a great way of actually tying the whole application together. See an example here. Load balancing? Sure, your web servers can produce resources that are consumed by the load balancer. You can easily replace the nodes in your application, assuming you have current backups. You might be able to re-deploy your database and have Puppet automatically update your web servers. Now that you have an idea on how the language looks like, you should read the full documentation. It’s worth noting that the Puppet Orchestrator, which is the set of tools that will actually make the orderly deployment possible, is not referenced here. But you can learn about it from the documentation linked above and below. [*] This article was originally authored for the Puppet Labs Blog (http://blog.puppetlabs.com). Yeah, I know I’ve neglected my Blog, but hey, I’ve been busy!. I did a short presentation on how to automate the configuration of Arista devices with Puppet on the Arista meetup. Luckily I recorded it, for those of you who weren’t lucky enough to see it live. Video of the screencast is below. Another week, another commute to a different country. You do have to love Europe!. Anyway, with an hour on my hands, I starting thinking back to, well, probably the question I get asked the most: “What can you do with Puppet?”. There is probably no short or straight answer to it, so I tend to start enumerating anything that might be relevant, and lately I’ve been finishing up with, “and also, if you have anything that expose resources through an API, well you can wrap Puppet Code around it!”. An excellent example of this, could be Gareth’s AWS module. It is also, too complicated to illustrate a principle, since it’s a fairly complex module, with quite a bit of Ruby code. For those who don’t know me, I don’t do Ruby… well… kind of. Ruby does have a number of brilliant gems (see what I did there? ), and since I have been hearing about Ruby, the one that always caught my eye, was Sinatra. It is one of those things that look amazingly simple, that are really powerful, and of course, I always wanted to play around with. With all these in mind, I decided to write an extremely simple REST API, and a Puppet Module around it with very simple curl calls, to demo how this would look like, and of course, I did it my way. # HTTP GET verb to retrieve a specific item. Returns 404 if item is not present. # Check if the string is actually present in the file and give a quick message in case this is being opened with a browser. Sinatra returns 200 OK as default. # or return the appropiate http code. So with a few bits and bolts of Ruby code here and there, here’s my full API example, with three basic verbs. #Extremely Simple API with three basic verbs. # HTTP PUT verb creates an item on the file. Returns HTTP Code 422 if already exists. # HTTP GET verb to retrieve all the items. # HTTP DELETE verb to remove a specific item. With a horrendous hack to recreate the file without the specific key. Returns 404 if the item is not present. So I’m sure there will be a lot of Ruby experts criticizing how that code is written, to be honest, and taking into account is the first piece of Ruby code I wrote, and that I lifted some examples from everywhere, I’m quite happy with my Frankenstein API. So let’s curl around to see how my API works. Note that when I try to PUT the item the second time, it returns an HTTP code of 422. By the way, I spent a bit of time researching which should be the right http code to return in this case. I think I got it right but if anyone has a table documenting how to map these, please do send it over. Please note that GET, of course, if the default action, but I’m specifying it just for documentation purposes. A GET to /items is returning the whole contents of the file, while a GET to /items/specificitem, checks if the items (a string in this case) exists on the file. A GET to a non-existent item returns 404. For all intent and purposes, that’s a great API, it even has error checking!. But the best is yet to come, now is time to actually wrap a Puppet module around it. As I’ll be using exec, I’ve to be spot on, around managing errors. Now here’s the kicker… in order for curl to return an HTTP error code >= 400 as an exit code > 0, you have to use the -f parameter in curl. A long long time ago, in a country far away, I wrote the Network Install guide for Fedora describing how to set up a tftp/dhcp server to PXE Boot machines, with a nice menu and all that. At the time, all the cool kids where using Satellite / Spacewalk, or were looking at server MAC Addresses in their CMDB / Inventory. It was published in 2008, I’m not a cool kid anymore, and it looks really outdated (much like my profile in the Fedora Wiki, including a picture from 11 years and 15 kilos ago). So it’s time to redeem myself in front of all those poor people that have been maintaning /var/lib/tftpboot directories, and dhcpd.conf files. In comes Razor, with a different approach to things. Razor is both a microkernel and a server side component. A bare metal server (or unprovisioned VM) boots this microkernel, collects all the inventory information, and sends it to the server through an API call. In turn, the server Razor server will evaluate that inventory information against a set of rules, and will provision the server with a base operating system (Linux, Windows, ESXi), and also configure a set of post install tasks (a.k.a. Brokers) in order to hand off the node to a configuration management tool, such as Puppet, or another one related to some culinary aspect. There is a lot of documentation available on how to set up a Razor server, and I’m not particularly a fan of reinventing the wheel. Of course you need a DHCP Server, (or if you’re into that, you can burn a boot.iso image, though you’ll still need a DHCP server to provide basic network configuration in order for the target server to reach the Razor Sever). 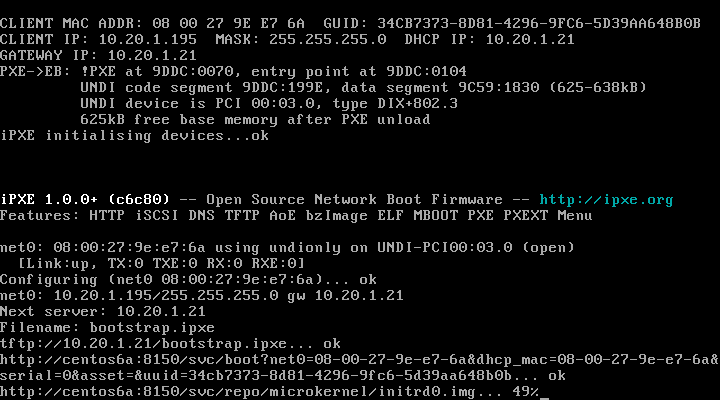 If your network booting ROM supports iPXE, the filename is ‘bootstrap.ipxe’, there is also an ‘undionly.kpxe’ image (dhcp option 67, filename in ISC DHCPd). Your should set up a tftp server (xinetd, dnsmasq, others) and of course add the parameter to your DHCP server (dhcp option 66, next-server in ISC DHCPd). The PXE image will in turn chainload either the microkernel, or the kernel/initrd of the appropiate Operating System (or Windows Pre-Exectution Environment). This will set up the Razor Server in the Puppet Master. Now it’s time to obtain the PXE images. You can get the ‘undionly.kpxe’ file here, and the bootstrap.ipxe file from the razor server itself. Just curl the contents of http://razor:8080/api/microkernel/bootstrap?nic_max=N to a file, but don’t use localhost, since it actually hardcodes the server name. Drop those two in your tftp home directory. That’s razor booting by the way, give it a couple of minutes (about two in my demo environment) and all your facts about that node will be collected. So when your node is inventoried, you can issue a ‘razor nodes’ command to see which nodes are ready to be provisioned with razor. Since razor is nice enough to tell us to keep digging, well.. lets! As you can imagine, this will take a while. Pop up a new shell, and let’s look at brokers in the meanwhile. Brokers, are basically the way to handover the server to a post-install configuration management tool, (such as Puppet), and also run some post install tasks. If you want to create your own broker (to set up DNS records maybe? ), you can read the official documentation, and other prebuilt brokers are documented in the source tree. Finally, we have tags and policies. Tags are applied to server based on ‘rules’ that evaluate ‘facts’. Finally, you need to create a Policy. Bare in mind once a policy it’s created, Razor will start provisioning all your nodes as per that policy, so in a brownfield environment, either try to be as specific as possible, or follow these suggestions. Taking into account that it took me a couple of days to write this article, I’d say my technological debt with the community is now settled!. © 2018 Nicolas Corrarello with Jekyll. Theme: dbyll by dbtek.